1. The Ferry Ride. We chose to take the high-speed ferry from Hyannis to Nantucket and it was the perfect 1 hour adventure. We got a snack on board and played games and watched the water splash against the windows. Because the ferry went really fast and was a little bumpy, we only stayed inside and didn't explore the boat much (other than a few potty trips). We loved the ferry because it had an easy boarding process, felt like we were on a ride at Disneyland, and it dropped us off right in downtown Nantucket so we could begin our adventures. 2. Bike Rides. 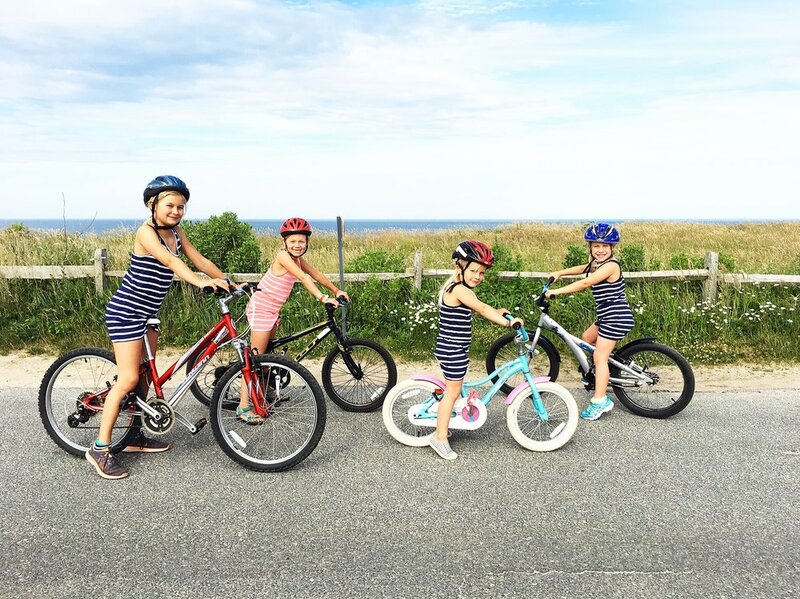 Nantucket Island is covered in bike paths and instead of renting a car we opted to only use bikes the entire time we were on the island (we did use Lyft and Uber a few times too). We rented from Easy Riders Bicycles and the process was very easy. They had kids' bikes for the older girls and a bike seat for our younger daughter. We picked our bikes online, confirmed them over the phone, and they dropped off the bikes at our rental house with locks and helmets and picked up the bikes on our last day. We biked to the beach, to get groceries, to the lighthouse, and we even figured out how to ride a bike while holding an umbrella stroller plus beach gear (not an easy feat). Every night before bed we'd ride bikes to the Sankaty Head Lighthouse to catch fireflies and watch the sunset. 3. The Food. We'd heard all about the food on Nantucket before we got there and couldn't wait to eat out. Of course, we stopped at the famed Juice Bar daily for ice cream and Aunt Leah's Fudge for candy. We also picked up Steamboat Pizza slices to take the beach several days and we grabbed sandwiches from Claudette's in Sconset. We ate a few meals at our rental house to keep costs lower but one night we went out to B-ACK Yard BBQ with the kids. They had a great kid's menu and the servers were really attentive and you could tell they enjoyed kids. For an adults-only activity we ate dinner at The Chanticleer in Sconset and the food was delicious and the ambiance was perfect. There were so many restaurants we wish we could've tried, but our visit was too short. 4. Beaches. There are so many beaches to choose from in Nantucket. We only made it to three beaches, but they were each wonderful in their own way. Our first stop was Sconset Beach because it was close to our rental home. The beach is quiet and relaxing and not very crowded. We saw a seal in the water, which was pretty exciting. There is a nice, new ADA accessible playground near the beach and bathrooms a few minutes away in Sconset Village. When we got hungry at the beach we grabbed sandwiches in the Sconset Market and Claudette's. Our second stop was Children's Beach because we heard a lot about it. 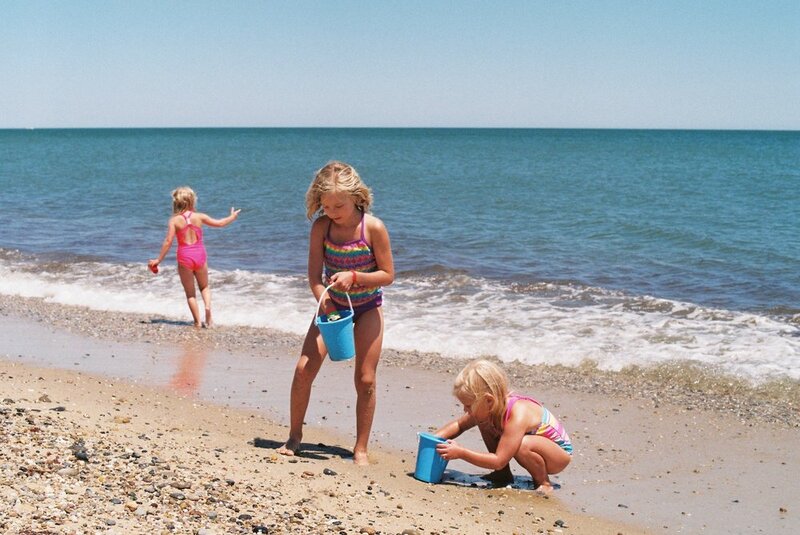 This beach is right in Downtown Nantucket and close walking distance from everything in town. The beach doesn't have very many waves because it is in the harbor. There is a big playground by the beach, a grassy area for picnicking, a snack shack, and places for kids to catch crabs. During the summer months the park also hosts a variety of games and activities. Our last beach stop was Jetties Beach. To get to this beach you can take a shuttle from downtown, ride your bike, or walk. We walked, but it was a little far for little legs. The waves at Jetties are small and calm so it is almost like swimming in a pool and there is a sandbar that our kids swam out to and played at for hours. We also loved that they had a place to rent beach equipment and had changing rooms, showers, and a snack bar. There was also a little playground near the beach. I tried to ask my kids which of the beaches was their favorite, but they couldn't pick. I know we missed several other great beaches -- so, we've got a few to try next time! 5. Lighthouses. Lighthouses are a quintessential symbol of Nantucket. Nantucket has three lighthouses. We managed to visit two of them. Sankaty Lighthouse is on the Eastern Shore of Nantucket (it was a 5 minute walk from our rental home) and it used to be much closer to the edge of cliff but was moved because of erosion. 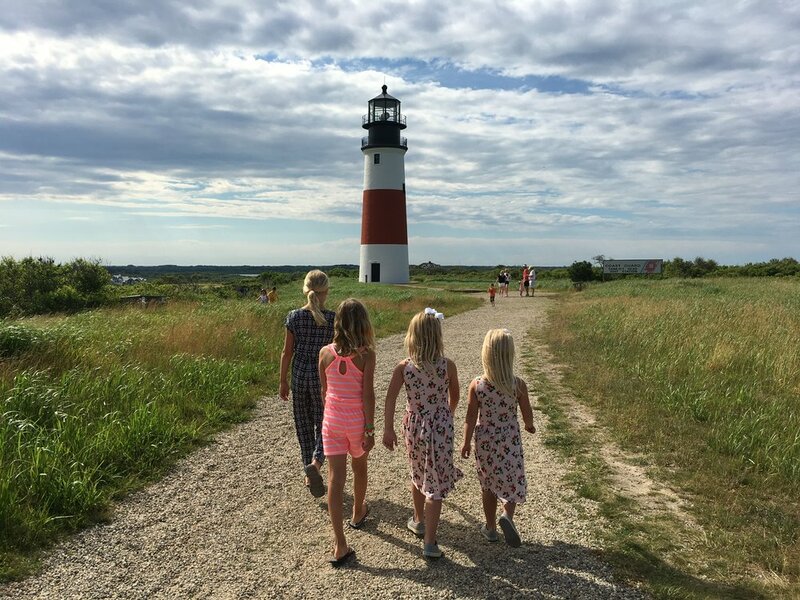 It is a beautiful lighthouse and we loved watching it shine every night, Brant Point Lighthouse is one of the most popular lighthouses on the island and the one you see as your ferry comes and leaves Nantucket. It is customary to throw two pennies in the water when leaving the Nantucket Harbor, one for luck and one to ensure a return trip. The last lighthouse is the Great Point Lighthouse located on the Northeast tip of the island. The area is only accessible by a 4-wheel drive vehicle or a 7 mile hike in sand. 6. The People. 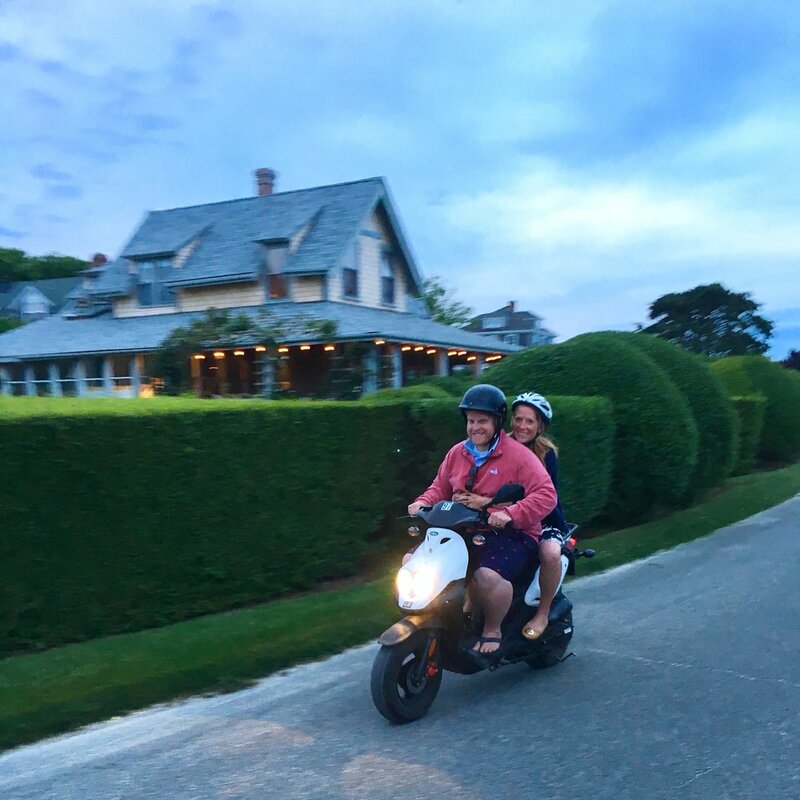 We can not express enough how much we enjoyed getting to know the people of Nantucket. Most of our conversations were with small shop owners, restaurant servers, and taxi drivers and they helped us get to the know the island better. We also loved how much everyone enjoyed our kids. 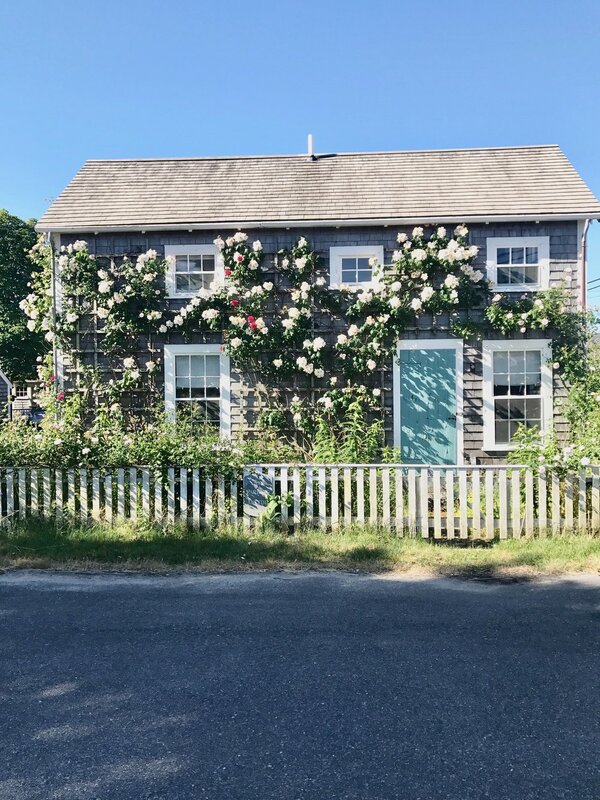 Nantucket can see a bit intimidating when you arrive (it is a little high brow) and I was a little nervous about how my kids would fare but families with kids were treated very kindly and accommodated. 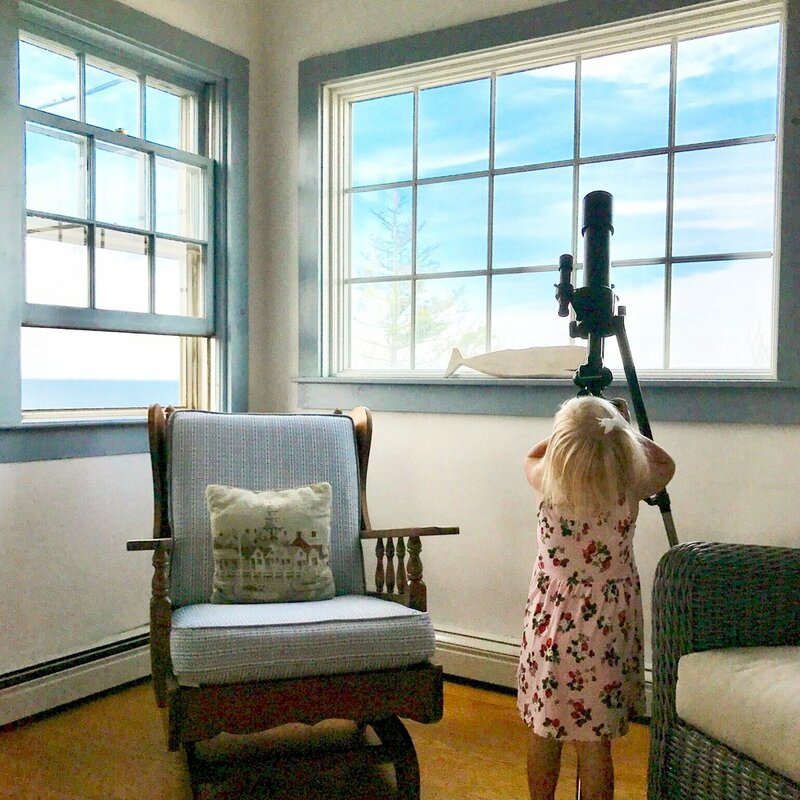 For a few brief scary moments we lost our six-year old when we were wandering around town and we had so many people offering help to find her -- luckily a nice elderly couple found her immediately and kept her safe til we could get to her. 7. The Wave. Most people don't take cars to Nantucket. It is pricey and the traffic is pretty horrible. However, we were able to get all over the island thanks to The Wave, which provides seasonal island-wide bus service. Children 6 and under are free on the bus and adults are either $1 or $2 depending on the loop you take or you can get a multi-ride pass. The bus was our favorite way to get around the island, particularly because we stayed in Sconset seven miles from downtown. There is something about kids and buses too, they acted like it was a ride at Disneyland. And, we loved meeting other families on the bus and usually we'd see those same families on the beach. The bus rides provided a great opportunity for our kids to make friends and for the adults to relax and avoid having to drive in Nantucket traffic. 8. The Scenery. I can't say enough about the beauty of Nantucket. My kids commented regularly how gorgeous the houses and flowers are. But, I will say the scenery is what made me love Nantucket the most. I love the architecture, gardens, flowers, ocean views, smells, rolling hills, cliffs, bike trails, etc. In my dreams I live on Nantucket. And, I kinda feel like when you are somewhere that beautiful and your kids are whining or complaining it doesn't seem that bad, because you are in paradise. Have you been to Nantucket? Did you take kids? What was your favorite part? We'd love to hear from you.